If you're looking for the ideal make-ahead breakfast for Christmas morning, look no further. Seriously, just stop your search and make this. You can thank me for it after. Or pop by on Christmas morn just as I'm pulling it out of the oven. I'll pour you a coffee with some Bailey's and dish up a plate of bread, cheese and eggs all cooked together so they become one. It's amazing how that happens, isn't it? How you can put a bunch of good things together in a casserole and when they come out of the oven they become one ultra amazing thing. Seconds, please! This strata recipe comes from my good friend, John, who makes it every year for our Pride brunch. I told you a little about our super special brunch in this post. It's my second favourite day of the year next to Christmas, and in no small part because of this strata. This is a little like the Christmas morning life saver that people used to make, only it's about 1.487 million times better. On Christmas Eve, you'll want to get some good French bread, cut or torn into largish cubes. You'll layer that with lots of caramelized onions and garlic and some kale (which is really just like spinach but so 2014). Next comes the cheese. Yes cheeeeeeese please! Gruyère AND white cheddar, just cause there's no such thing as too much cheese. Then you're going to pour over some eggs beaten with some milk so everything starts to stick together and become one. Then here's the best part: you cover it up and put it in your fridge. When morning comes and you need to refuel quick after presents all you have to do is take it out of the fridge and put it in the oven. How easy it that? 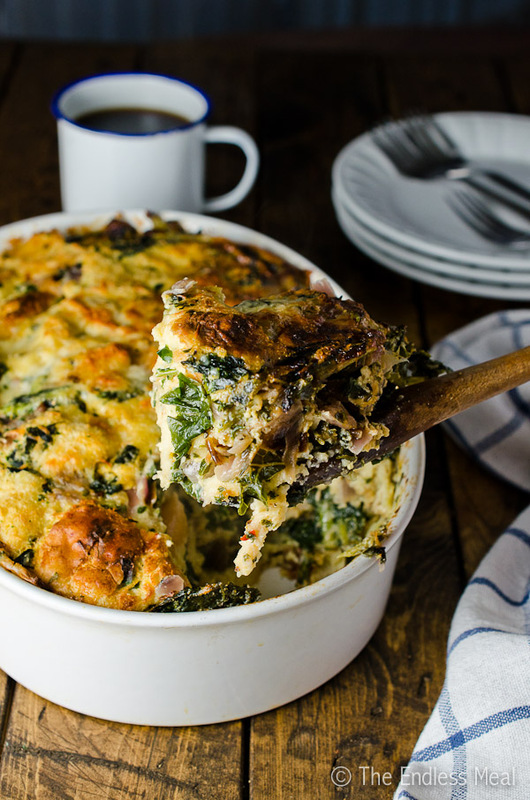 If you make this Gruyère White Cheddar and Kale Strata Recipe, make sure to snap a pic and tag @theendlessmeal on Instagram so I can like and comment on your photos. I love seeing TEM recipes you create. This is my favourite strata recipe. Strata is one of the best make-ahead breakfasts. It's cheesy, bread-y and eggy and can be made the night before. Heat the oil in a large frying pan over medium high heat. Add the onion and cook, stirring occasionally for 5 minutes, or until the onion is soft. Add the garlic and cook for 30 seconds more. Add the kale and let it cook until it has wilted. Add the salt, pepper and chili flakes, stir to combine, then remove the pan from the heat. Butter the bottom of a 12″x9″ baking dish. Add ⅓ of the bread cubes then top with ⅓ of the kale and ⅓ of each of the cheeses. Repeat 3 times, reserving a small handful of cheeses. Whisk together the eggs, milk and dijon mustard in a medium sized bowl. Slowly and carefully pour the mixture over the bread. The pan will be very full so you will need to go slow enough to give the eggs and milk time to soak into the bread. Top the strata with the remaining handful of cheese then cover tightly with aluminum foil. Either bake right away, or refrigerate the strata for up to 1 day. If you have refrigerated the strata remove it from the fridge. Preheat the oven to 350 degrees. Bake the strata for 45-55 minutes, or until it is puffed, browned and set in the centre. Looking for a strata type dish to do for a finger food brunch, this sounds yummy. I like that you added Dijon and chili flakes. I often add a hint of Tajin. I was taught quiche ratio was 3:1, I see yours is 4:1. Do you think this is firm enough to cut into 2×2 squares? Thank you. I’m honestly not sure as I’ve never tried to freeze a strata before. My husband hates kale would there be something I could substitute? This recipe looks amazing. I love breakfast dishes. Spinach is also great in this recipe! this was linked in a recent post on foodcrush, so happy to have found it, I have a more basic breakfast caserole recipe that’s become a bit tired and this looks like a great alternative, thank you! It’s so fun to switch up old favorites, isn’t it?! I hope you like the recipe as much as we do! When you cube the French bread do you include the crust? So I’m trying to make this today abd I think I may have added too much bread? Should the bread be totally soaked before baking or is it okay if some(towards the top) isn’t ? Awesome! Yay for lots of kale!! Do you remove the foil before baking? Looks so yiu and thanks for sharing! Yes, you do. Sorry that wasn’t clear! Would like to work up a gluten free version. If you do let me know how it turns out! Why oh why do i do this to myself at this time of day. This looks amazing and definitely the best cheesy eggy bread thing I have ever seen. Hope you loved it as much as I do!! Thank you so much, Ginnie! 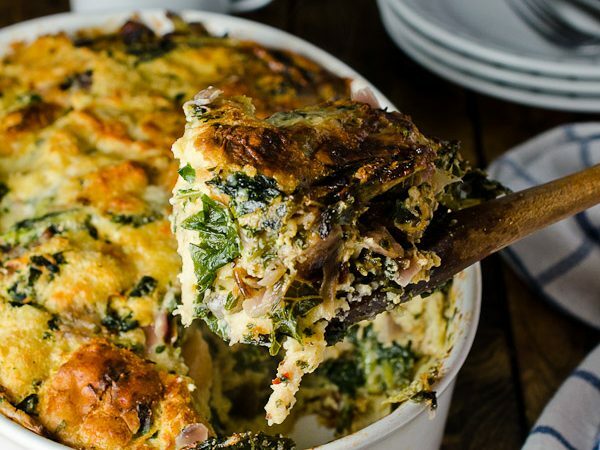 I’ve never made a strata before, but after seeing this post – it is definitely something that I need to make! Thanks for the delicious idea and recipe. Oh this looks like such a wonderful make-ahead dish for Christmas morning. And I love the name :-)!